With remote access to patient images and measurement tools, cardiologists and cardiovascular clinicians can spend more time making critical diagnostic decisions and less time chasing data. Whether at the lab or at home, they can quickly retrieve and review patient images, consult with other physicians, and make informed clinical decisions and treatment. 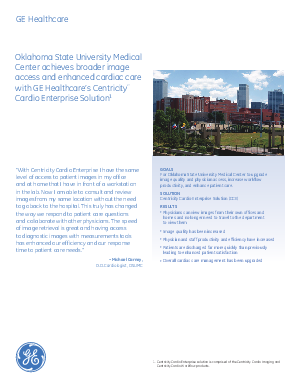 Learn how Centricity Cardio Enterprise Solution1 has helped enhance the health of Oklahoma State University Medical Center by. 2, 3 Oklahoma State University Medical Center (OSUMC) case study, August 2013. Results may vary and do not constitute a representation, warranty or performance guarantee. General Electric Company reserves the right to make changes in specifications and features shown herein, or discontinue the product described at any time without notice or obligation. This does not constitute a representation or warranty or documentation regarding the product or service featured. Timing and availability remain at GE’s discretion and are subject to change and applicable regulatory approvals. Contact your GE representative for the most current information. GE, the GE Monogram, Centricity and imagination at work are trademarks of General Electric Company. All other product names and logos are trademarks or registered trademarks of their respective companies. ©2015 General Electric Company – All rights reserved.